For the village in Iran, see Abla, Iran. For the name, see Abla (name). 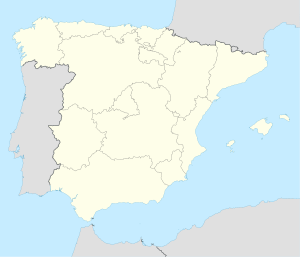 Abla is a municipality, former bishopric and Latin Catholic titular see in Almería province, in Andalusia, southeast Spain. It is considered to be the Abula mentioned by Ptolemy in his Geographia (II 6, 60) as located in the Iberian region of Bastetania. Another candidate for identification with ancient Abula is Ávila, which may instead have been the ancient Obila. Abula is said to be one of the first cities in Hispania that were Christianized, specifically by Saint Secundus, one of the group of Seven Apostolic Men (siete varones apostólicos), Christian clerics ordained in Rome by Saints Peter and Paul and sent to evangelize Spain. Little is known of a second bishop of Abula, called Iulius, possibly his successor, living around 100 AD. No other incumbents were recorded. No longer a residential see, Abula is today listed by the Catholic Church as a Latin titular bishopric since the diocese was nominally restored in 1969. Giorgio Corbellini (2009.07.03 – ...), President of Labour Office of the Apostolic See (2009.07.03 – ...), President of Disciplinary Commission of the Roman Curia (2010.05.11 – ...), President ad interim of Financial Information Authority (2014.01.30 – 2014.11.19), Supplementary Member of College for the review of appeals by clergy accused of delicta graviora (2015.01.21 – ...); also was, even previously, President of Personnel Commission of the Governatorate of the Vatican City State (2001.02.22 – 2011.09.03), Vice Secretary General of Governorate of the Vatican City State (2001.02.22 – 2011.09.03). Wikimedia Commons has media related to Abla. ^ a b ":: Ayuntamiento de Abla". www.dipalme.org. Retrieved 2017-08-30. ^ a b Avitiano (23 December 2008). "Abulenses". Centro de estudios abulenses. Retrieved 27 September 2014. ^ "Titular See of Abula, Spain". GCatholic. Retrieved 2017-08-30. This page was last edited on 11 February 2019, at 19:41 (UTC).